Infused with Vitamin B3, an ingredient known to reduce the appearance of skin discoloration. Broad spectrum SPF 30 sunscreen protects your skin. Clarant Even Skin Tone Daily Moisturizer with SPF is rated 4.3 out of 5 by 36. Rated 4 out of 5 by Littlepinkheart09 from Non greasy! 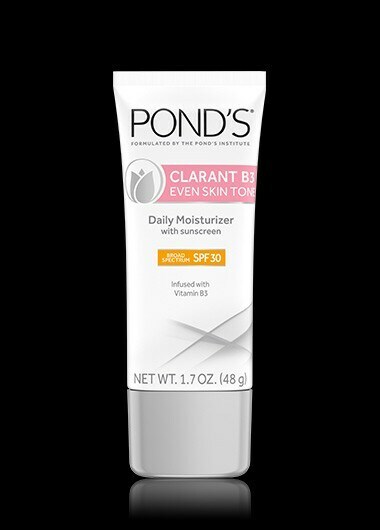 I'm really pleased that this Pond's Clarant B3 Even Skin Tone Daily Moisturizer with SPF 30 is not only non greasy, but lightweight and it leaves my skin looking matte. I normally don't like most facial sunscreens because they leave my skin feeling and looking oily, so I'm really happy to find one that doesn't. The formula does have a little stronger of a fragrance than I'd prefer, but it's still tolerable and not too overwhelming. I haven't been using this long enough to comment on whether or not I've noticed a more even skin tone, but I'm still impressed with this product as a moisturizer containing an SPF. Rated 1 out of 5 by Mrsfabulous from vitamin B3 Before this review, Am a diehard ponds user, uses ponds b3,rejuveness and crema S on a daily basis. This cream is advertised to contain vitamin b3(niacinamide) to reduce appearance of dark spots. But niacinamide is listed as the last ingredient. A product should contain a minimum of 3 to 4 percent of niacinamide to work. Rated 5 out of 5 by Kayla69 from Amazing Moisture I have very, very dry skin and this stuff worked awesome on my face. Not dry and flaky anymore! Rated 5 out of 5 by JessP from Love the results This moisture cream was a life saver. I was needing something to even kit my skin tone and make my dark spots fade. This product is perfect because it’s lightweight soft feel smooths onto my skin and then instantly seems to sink in without any heavy odors. Once on a few seconds later my face is soft and moisturized without feeling oily and gross. Reduces pore size and overal gives nice even skin tone. Rated 4 out of 5 by rachelannnnn from Skin benefits and SPF 30!! What I love most about this product are the ingredients, the individual purpose of the product and it has SPF! SPF 30. Also, don't forget the scent, it's great! The overall moisturizer not only help improve my skin, but is fast absorbing. The only thing I'm not sure about is it's so fast absorbing that if I don't put on the lotion quick enough, it'll dry out on my face. Rated 5 out of 5 by Beckie from Very pleasing to the skin This is a light silky moisturizer for daily use I had not tried it before but I have used many high end daily moisturizers. This one is suprisingly nice! Rated 5 out of 5 by Jodi from Great Product I enjoy your new product. It is smooth and I feel covered with the sun screen built in. I will surely purchase this product. Thanks for the sample.